SEE ME by Wendy Higgins – Cover Reveal! Wendy Higgins, one of my favorites, has a new book coming out this fall called SEE ME! She’s actually self-publishing this one since it’s got an interesting twist to it and I think it’s going to be really exciting and different! I was also chosen to be one of Wendy’s beta readers for this book and I couldn’t be more excited! You know how much I fangirled over SWEET EVIL so being able to beta read one of Wendy’s book is so incredibly exciting and I’m forever grateful to her for choosing me! Before we reveal the cover to you, here’s a little info about the book — And I really hope you’re excited for this one! Where You Can Purchase: eBook: Amazon, B&N, Kobo ($3.99); Paperback: Amazon, Createspace ($10.99) — This book will not be available for preorder. This book is being self-published by the author and her agent. Author Bio: Wendy Higgins is the author of Sweet Evil and Sweet Peril from HarperTeen. She lives in the Washington D.C. area with her husband, daughter, son, and puppy Rue. Synopsis from author Wendy Higgins: “While most seventeen-year-old American girls would refuse to let their parents marry them off to a stranger, Robyn Mason dreams of the mysterious McKale in Ireland, wondering how he’ll look and imagining his cute Irish accent. Prearranged bindings are common for magical families like her own, however when she travels to the whimsical Emerald Isle she discovers there’s more to her betrothal and McKale’s clan than she could have imagined. IRISH FANTASY AND MAGICAL REALISM. How cool is that!? I’m excited for a different kind of magic and some possible leprechaun lore! Okay. NOW. I know you’re waiting for the cover and I think it’s pretty fantastic, so without further ado…. 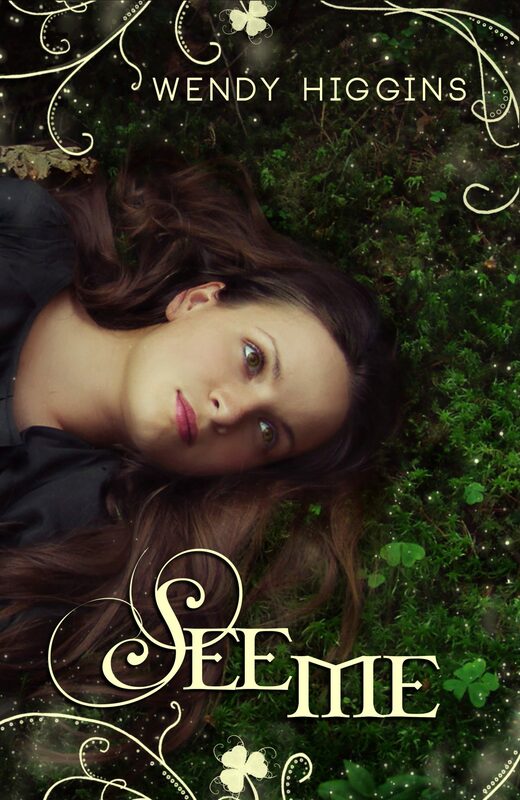 The cover for SEE ME! I love the shamrocks and all the green!! I can’t wait to read about Ireland and some Irish fantasy! Hope you guys enjoyed the cover reveal! You can also find out more about Wendy and her books at the links below! This entry was posted in Books, Fantasy, YA and tagged Books, Cover Reveal, Fantasy, Ireland, Irish, Magic, Magical Realism, See Me, Wendy Higgins on July 13, 2013 by Brittany.